irvine, Calif., Jan. 11, 2017 – The Motor City today got an up close look at the refreshed 2017 Forte when Kia Motors America pulled the silk off the updated compact sedan at the North American International Auto Show in Detroit. The 2017 Forte sedan has been improved for the new model year with subtle visual changes, a new 2.0-liter 4-cylinder powertrain engineered for improved fuel economy and performance, and a host of advanced convenience and driver-assistance features. Pricing for the 2017 Forte will be announced closer to the vehicle’s on-sale date in the first quarter of 2016. Visual enhancements to the 2017 Forte add even more sophistication to its European sport-sedan styling. Up front, the Forte dons a new front bumper and “tiger nose” grille that has been extended to connect with new headlights, much like the all-new 2016 Optima. This new take on the front fascia gives the Forte a more fluid appearance, and customers will have the choice of two designs, one highlighting the Forte’s sophisticated personality and one that’s more aggressive and sporty. Completing the exterior redesign are newly designed taillights, with optional LEDs. Now available in three trims, a new sporty S trim sits in between the entry-level LX trim and the top-trim EX model. The new S trim amps up the Forte’s dynamic demeanor by adding a sport-tuned suspension, 16-inch alloy wheels, LED daytime running lights, rear spoiler, and a chrome exhaust tip. For 2017, the EX trim remains the top of the range, and with that, comes standard with premium exterior features such as LED taillights, Smart Key with perimeter approach lighting and front door pocket lighting, and new 17-inch alloy wheels. Like its bigger Optima sibling, the Forte is available with Dynamic Bending Light technology, which uses steering wheel inputs to angle the light around corners and bends. Inside, LX and S trims get upgraded cloth materials for the seats, with the S trim featuring exclusive black cloth seats with white contrasting stitching, as well as a leather-wrapped steering wheel and shift knob. The EX now comes standard with leather seats with heated front seats, 10-way power driver seat with a two-position memory setting, dual-zone automatic temperature, rear vents, and a push-button start with Smart Key. As for infotainment, both the S and EX trims come standard with UVO3[i] telematics, which is displayed on a 7-inch color touch screen and includes a suite of core smartphone functions via Android Auto and Apple CarPlayTM (late availability). Both platforms elevate the Forte’s in-vehicle connectivity by allowing drivers to conveniently use the touchscreen for smartphone functions like sending text messages, streaming music, and looking up driving directions. 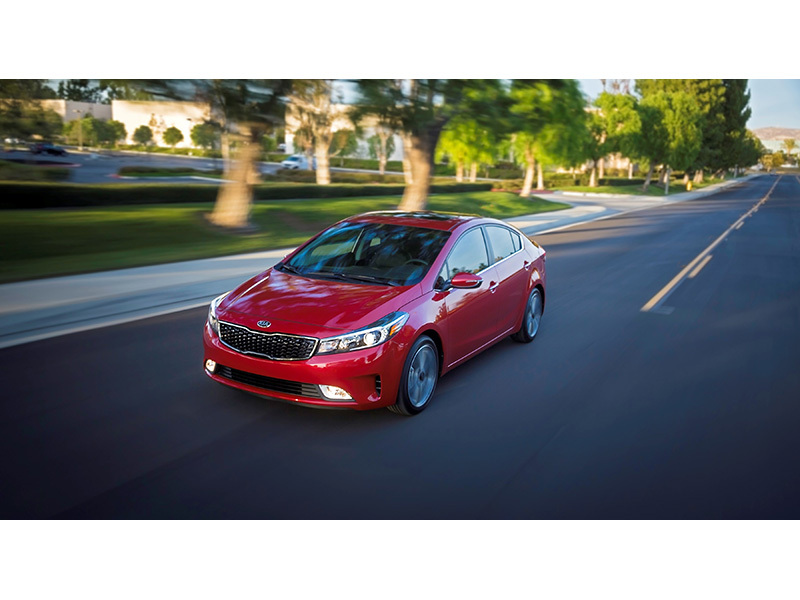 Depending on trim, the Forte will also come with Kia’s latest navigation system. All trims come standard with Drive Mode Select, which allows the driver to change the driving experience based on their preference: Normal, Eco, or Sport. Further solidifying the Forte’s value proposition is its long list of available convenience features, which includes Autonomous Emergency Braking, Front Collision Warning, Lane Change Warning, Lane Keep Assist, Blind Spot Detection, Lane Change Assist, and Rear-Cross Traffic Alert3. Replacing last year’s 1.8-liter inline-4 cylinder engine beneath the hood, the 2017 Forte now comes standard with a 2.0-liter Atkinson I-4, which is paired with a six-speed manual transmission or an available second-generation six-speed automatic transmission that has been engineered to help improve fuel economy[ii]. The EX trim is equipped with the tried-and-true 2.0-liter GDI I-4 and six-speed automatic. Power ratings and fuel economy figures will be released closer to launch, while 2017 Koup details will be released at a later date. The Forte sedan will be produced at Kia’s new state-of-the-art manufacturing facility in Monterrey, Mexico, making it the first vehicle to be built at the automaker’s second North American plant. Production at the Mexico facility is slated to begin in the first half of 2016. [i] Warning: Driving while distracted can result in a loss of vehicle control that may lead to an accident, severe personal injury and death. Always drive safely and use caution. Navigation is for information purposes only, and Kia does not make any warranties about the accuracy of the information. [ii] Actual mileage will vary with options, driving conditions, driving habits and your vehicle’s condition.